Distribution authorized to DOD and DOD contractors only to protect technical or operational information from automatic dissemination under the International Exchange Program or by other means. 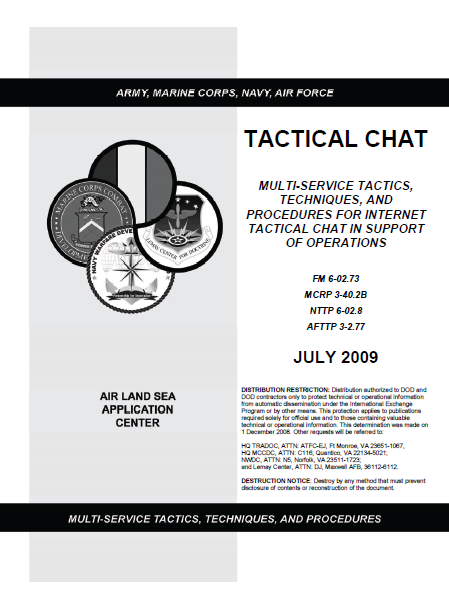 a. Tactical chat (TC) is a near-real-time, multi-participant means of textually communicating among military units. TC allows for predominantly jam free communications, similar to radio voice communications, over the internet. Anyone with a computer, a network connection, and compatible TC software can communicate textually using TC. In some instances, TC is the most effective means for warfighters to communicate, especially when mission conditions hamper information that would typically pass over voice communications. Therefore, in many cases text chat is the preferred method for warfighters to collaborate on urgent matters while helping to reduce radio and phone traffic. b. TC provides synchronous conferencing primarily designed for groups in discussion forums, but can also be used to facilitate one-on-one communications via private messages or data transfers. A TC system composed of common-use software applications enables users at computer terminals to communicate with other terminal users using text. TC communications occur in “chat rooms” which are designated within a specific network to facilitate command and control (C2) or to coordinate information. c. TC communications are analogous in function to radio communications. They must be clear, concise, and correct to be useful. TC must be structured in a way that is easily understood by the intended recipient while conveying an unambiguous message or directive. A good rule of thumb is to treat TC just like talking on a radio; less is more. However, TC is by no means the approved solution for all tactical communications. When communications are likely to raise questions, voice communications via phone or radio should be used to mitigate any potential for confusion. d. Currently guidance across the Service’s describing the standardization and regulation of TC for use as a coordination tool is limited. Standardization is critical for the joint force commander to ensure communications are professional, disciplined, and clearly understood. e. TC does not replace existing formal communications and its use must be consistent with existing doctrine and established procedures. TC is an enabling tool that can be used for coordination, integration, and execution. (1) As a coordination tool, TC allows one user to coordinate tasks and distribute information to multiple groups across units both up and down echelons. (b) From text chat to voice nets. (c) From other digital systems to text chat. (3) As an execution tool, the ability to send information quickly to a broad base of users on TO facilitates the timely and accurate dissemination of commands, fragmentary orders, or mission changes critical to mission accomplishment. (1) Chat-specific Applications. Chat-specific applications are “single purpose,” stand-alone software programs placed on a network of computers with the primary purpose of communicating via text. Jabber, Groove, mIRC and InfoWorkSpace (IWS) are commonly used chat-specific applications. (2) Systems of Record (SOR). SOR are existing hardware and/or software applications with a specific function unrelated to TC, but they have an embedded chat capability. Advanced Field Artillery Tactical Data System (AFATADS) and Blue Force Tracker (BFT) are SORs currently used by tactical units. a. Inaccurate or misleading information is widely disseminated and passes to all TC users as quickly as accurate information. Retraction procedures are difficult and the inaccurate information is still kept in the room record. b. Multiple incompatible TC programs may be in use in a theater of operations with different functionality and user interfaces. c. TC room participation cannot be effectively controlled without extensive measures such as room password protection. d. Collaboration with multinational members using TC is challenging due to security restrictions. Work-arounds are required to communicate with multinational members on other networks but they must still comply with theater security restrictions. e. The authority of command information can be questioned due to misunderstanding or misidentification of the source sending a message or post. f. Receivers of critical information must have the correct chat room open and easily visible to get data in a timely manner. g. TC requires orders, questions, answers, suggestions, and discussion to be typed, thus slowing communications flow and introducing the potential for error when used by less experienced users. h. TC requires a constant network connection to all locations and platforms. i. Any user can create a room, which makes spontaneous room proliferation difficult to control and creates the potential for critical information to flow outside of normal channels taking focus away from primary rooms that require participation. j. TC includes features that allow for private chat, which can inhibit information flow and the situational awareness of the main chat room. k. Unlike chat room traffic, private chat is often not recorded, interrupting the logic trail and creating incomplete historical records of TC communications. l. Textual data lacks inflection and emphasis when communicating information and commands, which creates perception challenges for intended receivers. m. Short text messages can cause ambiguity and accuracy can be compromised without strict adherence to standard terminology (see appendix A). n. Airborne assets and units relying on satellite links may still experience intermittent operations caused by electro-magnetic interference. o. Not all C2 platforms are able to accommodate TC. Airborne C2 assets that are TC capable may not have the personnel onboard to devote sufficient attention to multiple chat rooms compared with land or ship-based units.